Founded by lifestyle futurist Shel Pink, SpaRitual fuses a mind, body, spirit connection with healing spa traditions to create a world of Slow Beauty. Specially sourced vegan, certified organic and fair trade ingredients from around the world are used to create SpaRitual products for body, hand and lifestyle. 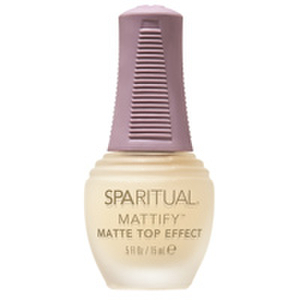 SpaRitual's natural formulations never use synthetic dyes or parabens, and their vegan Nail Lacquers and Nail Care Treatments are also free of toluene, formaldehyde, formaldehyde resin, camphor and DBP. SpaRitual stays on the pulse of sustainability issues to ensure their products; processes and packaging are as environmentally responsible as possible. SpaRitual's brand philosophy encourages women to approach beauty as a holistic connection to oneself and to the environment. When you enter a spa, your mind and body begin to slow down and relax. The SpaRitual range aims to capture that feeling of calm and stillness with its holistic range of beauty products. With a commitment to organic ingredients and chemical-free formulations, SpaRitual recognizes its commitment to the natural environment while delivering effective body treatments and nail care products. Behind the SpaRitual philosophy is the recognition that too much of modern life is rushed, hectic and stressful. By slowing things down and encouraging women to savor their beauty routines, SpaRitual aims to re-establish the connections between body, mind and spirit. This holistic approach helps women to feel and look great. SpaRitual advocates a four-stage approach to its relaxing beauty regimen. Each stage provides scents and colors that help create a multisensory experience. With a calming, soothing palette of blue shades and a relaxing scent of Egyptian geranium, Close Your Eyes helps to generate an atmosphere of harmony and peace. The earthy browns and berry shades in Look Inside mingle with the scent of Indian frankincense to ground individuals and create a sense of equilibrium. Bright reds, oranges and magentas combine with Indonesian ginger to awaken Instinctual creativity and emotion. The scent of Chinese jasmine nurtures the mind and restores the body while peach, pink, rose and white shades form an Infinitely Loving embrace. From the ingredients that find their way into the exquisite formulations to the sumptuous packaging, every aspect of the SpaRitual range respects the environment and is ecologically-friendly. It's always nice when you can use a product good for your appearance and health that also happens to tread lightly on the environment. SpaRitual Products are an example: Many of the ingredients use to formulate the brand's vegan treatments are wild-crafted or organic. The special sourcing and extra devotion come through when you're using these nail lacquers and other items: This is a company that cares about its place in the world. You benefit from that care, too: SpaRitual Products, with their botanically derived foundation, lack the suite of harsh chemicals, animal products, and other undesirable additives that constitute so many other cosmetic formulations. You'll be amazed at the lustrous range of colors, and rest content in the knowledge that the SpaRitual Products emphasize natural components and avoid synthetic dyes. You'll find beautiful hues and fragrances in the SpaRitual collection to match any state of mind. Work them into your daily routine and start dissipating stress and anxiety, simply immerse yourself in these evocative treatments. Great cosmetic products aren't just about looking your best: They're about feeling good and connecting with the sensory world around us. SpaRitual Products do just these things and more, transmitting to the universe that day's mood and intent. Plunge into the world of SpaRitual colors. The SpaRitual Nail Lacquer Drop Dead Gorgeous brings you a vegan-friendly nail lacquer of a rich, shining magenta. This luxurious hue is associated with acting naturally and following the heart; get those nails coated and let your inherent spirit shine forth. The SpaRitual Nail Lacquer Drop Dead Gorgeous, like the other SpaRitual products, is free of harsh additives, like DBP, formaldehyde, and toluene, and instead derives from natural, healthful ingredients. Let your inner wildness and adventure come out with an application of the SpaRitual Nail Lacquer Provocateur, a striking blaze of fuchsia crÃ¨me sure to turn heads. Like the other nail lacquers of the SpaRitual line, the Provocateur is hand-blended, ensuring the most full-bodied and efficiently applied polish possible. And you're showcasing your feisty wild child with all the confidence that comes with knowing the product you're using emphasizes environmentally friendly and dermatologically gentle ingredients. Romance and contentedness seem bound up in the hot pink blaze of the SpaRitual Nail Lacquer Melt With You, an invitation to seamlessly merge with your heart's yearnings and fancy. You can dexterously paint your nails this irresistible hue with the precisely designed brush that comes with the package. Don't waste time with chemical additives: Embrace the green with the SpaRitual vegan lacquers.